What an unbelievably weird game this is and yes it's another Japanese game. I need to state at this point that the game developer has mentioned this as a Trial Game but from what I can tell from playing it is it's an alpha or beta version of a final product that does need some more work. Or it's just a demonstration of the game developers talents. 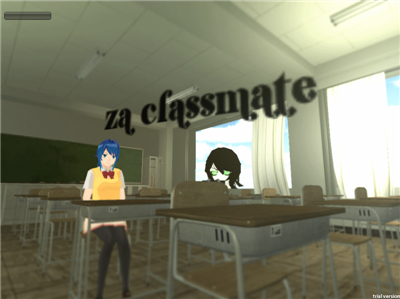 Za Classmate is by far a tricky and maybe even a controversial game to some, in that you as the player walk around different rooms and areas shooting other classmates that seem to be grouped around other singular students. Maybe they are captive. 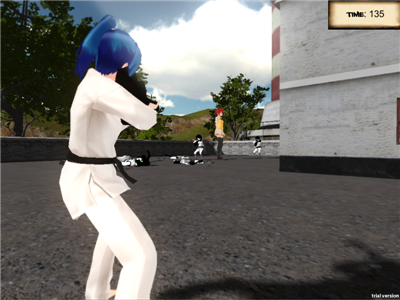 Now while on this touchy subject, the game developer has replaced the guns with a small black guitars and changed the guns aiming cross-hairs with a circular star icon, but this doesn't change the fact that you're shooting and killing other students. I suspect it was changed to these things as it may have been a banned game otherwise. 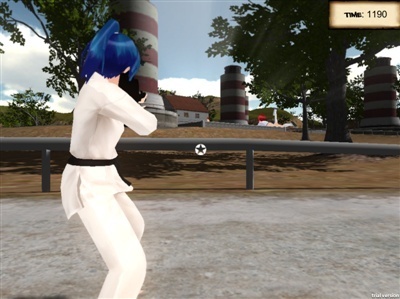 One question I have to answer is why is the player dressed in martial arts uniform? Why are we shooting other female students? There are no male characters in this game and it definitely needs a storyline. I'm sure it's being worked on as there are parts of the game prompting you to press E but nothing is written in the characters speech bubble. To start the game, press the small dark rectangular box in the top left hand corner. From what I've played of it so far since last night and this afternoon there are 4 levels. They include a classroom, an outdoor park/reserve warehouse area and an office area. This is all I've found but there is 1 more level. The first level is small and quick. 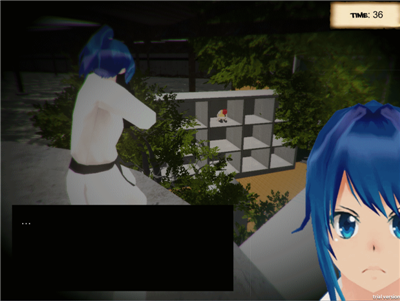 The second level is larger with more freedom to explore, even though not a lot to see, what's there is very well done. There is something massive if you'll willing to walk the distance but I'm sure you'll work that out before getting there. The third office level I've just started and the action here is much more than the first 2 levels. It doesn't seem to be possible to die but there is a way for you to end gameplay and I'll let you discover that for yourself as well as other strange touches. The graphics and level design, if at times strange, are great however player movement needs more attention. I found it easier, especially on level 2 following the road, to sideways walk than to walk forwards. It seems buggy when walking forwards. If your a shooter gamer with an appreciation for the weird and wonderful and you have an open mind. I'm sure you'll get some pleasure form this 175mb download. You'll need a decent PC with good 3D card to play it on full 3D setting but you should be able to get away with a 128md 3D card set to minimal game display settings. 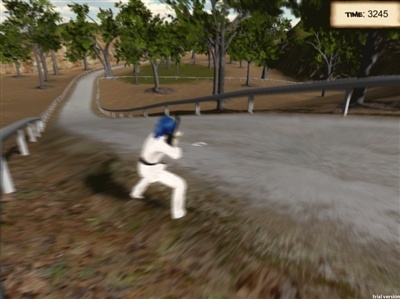 It is powered by Unity Web Player, game version 1.00, made 06/07/2014. I'll be looking forward to seeing a final game version result. Strange but interesting to say the least. » Sindrom engine mati -- coil atau rectifier atau carburator..